Meet the BOS Nyaru Menteng Release Candidates! The BOS Nyaru Menteng Orangutan Reintroduction Center is releasing 21 orangutans back into the wild this coming November! We’re publishing 3-4 profiles per day, leading up to the momentous D-day. Keep checking back! Shout out to all the BOS partners! Great job, everyone!!! 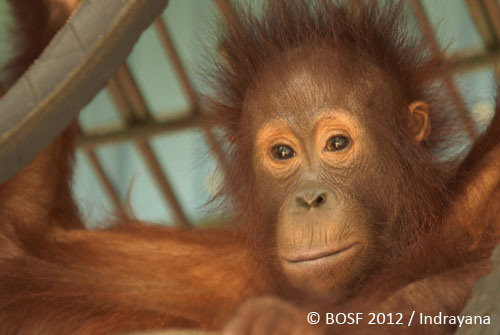 Support BOS Nyaru Menteng by adopting Baby Elo! 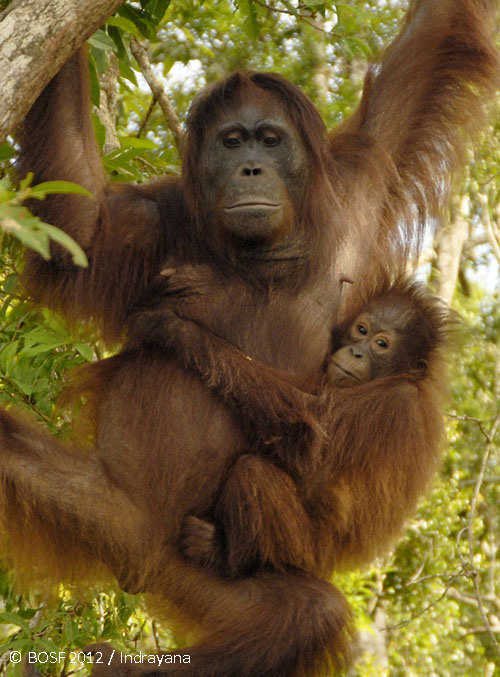 Dictionary Time: "Semi-Wild" & "Rehabilitants"
Semi-wild are orangutans who still retained their true nature at the time of rescue and have consistently showed that they have learned adequate forest skills. Rehabilitants are orangutans who were rescued at a very young age and/or had been kept by humans as pets. These orangutans did not have or had lost most of the necessary skills to survive independently in the forest and thus must go through an intensive rehabilitation process (Forest School as well as the final pre-release stage on an island), which can take up to 7 years on average. Paluy was rescued from PT. Mustika Sembuluh, an oil palm plantation in Sampit, East Kotawaringin Regency. The female youngster was very feisty and wild, but because she was only 3.5 – 4 years old, she could not be released right away. 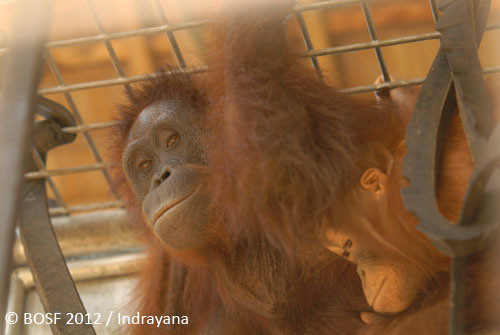 Instead, the Rescue Team took her to the Nyaru Menteng Rehabilitation Center on February 13, 2006. The high spirited young lady has dark red hair that has grown quite long around her forehead, framing her lovely face perfectly. She also has a wispy yellowish-brown beard as well as scars of unknown causes on the left side of her abdomen and both of her palms. Now at 10 years old and 43.6 kg, Paluy has never lost her wild demeanor. She is active, playful, but can also be aggressive. She still makes fierce kiss-squeaking noises every time a technician approaches to feed her or to clean her enclosure. Her solid independence clearly demonstrates that she is well qualified to roam free in a real forest. And that’s exactly what she is going to do very soon! Rescued from an oil palm plantation in the border of Sampit and Pangkalan Bun, East Kotawaringin Regency, Gundul was at that time 3 – 3.5 years old. This female orangutan was rescued with her mother and seven other orangutans; one of which was Bang Jagur who was successfully released back in March 2012. 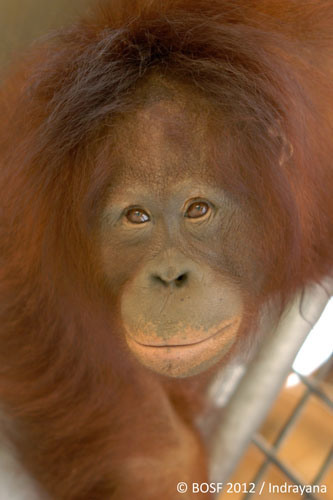 Gundul then entered Nyaru Menteng Rehabilitation Center on March 18, 2006. Unfortunately, her mother, Mama Gundul who was found badly injured finally passed away after two months of intensive care at Nyaru Menteng. Despite this tragedy, Gundul has thankfully grown into a self-reliant individual. She can be quite naughty sometimes, too and often teases the technicians by playfully pinching them as they clean her enclosure. She is now 9 years old with wavy thick hair and weighs 41 kg. And she will once again taste the good life in a real forest when she is finally released this November! This male orangutan was only 4 – 4.5 years old when he was confiscated at Seluching Camp from a staff of an oil palm plantation in the border of Sampit and Pangkalan Bun, East Kotawaringin Regency. Along with four other rescued orangutans, he was taken to Nyaru Menteng Rehabilitation Center on June 13, 2006. He was named Jamal after a restaurant in Sampit where the Rescue Team rested and had a meal. 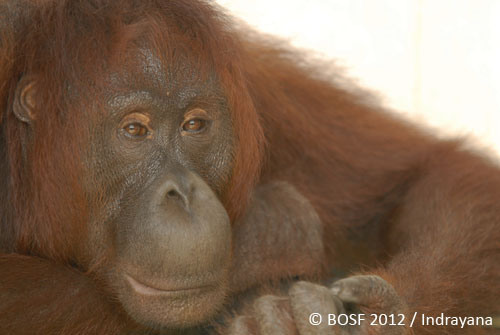 Six years has passed since his arrival at Nyaru Menteng and Jamal is now a very active 10 year-old, weighing 33 kg. His dark-skinned oval face and delicate dark red hair, there is no doubt that the agile teenager will soon grow into a dashing adult. And that won’t happen in Nyaru Menteng, but in the forest where he belongs because Jamal is going to embark on his final journey home! In October 2006, a report was received from a staff member of the BOS Foundation’s Mawas Program who was on duty in Mentangai. The report indicated that a villager had taken a baby male orangutan to the Tuanan Research Station and left him there. The Nyaru Menteng Rescue Team arranged to pick him up at the jetty of Mandumai Village in Pulang Pisau Regency. The orangutan, aged 3.5 – 4 years old, was taken to the Nyaru Menteng Rehabilitation Center on October 8, 2006 where he underwent treatment for wounds found around his mouth and all over his body. He was named Mangkutub. Today, Mangkutub has fully recovered from all of his injuries. He is a quiet and friendly 10 year-old who interacts well with babysitters and technicians. But if a new person or a stranger whom he has never seen before approaches, he immediately shows signs of dislike. Thin-haired Mangkutub now weighs a healthy 38.6 kg and after six years living in Nyaru Menteng he will finally be on his homecoming trip to the forest! 2006 was a busy period for the BOS Foundation as it was the year when many oil palm companies aggressively converted so much forested lands in Central Kalimantan into plantations. Orangutans as well as other forest animals lost their home and many did not survive. In an 8-day operation in the border of Sampit and Pangkalan Bun, East Kotawaringin Regency, the Nyaru Menteng Rescue Team saved 12 orangutans. 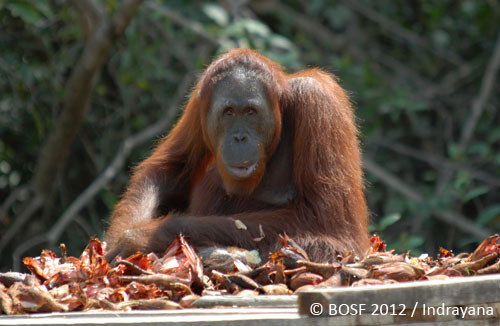 One of which was a 3.5 – 4 year-old male orangutan named Gusti. Along with the other rescued orangutans, Gusti was taken to the Nyaru Menteng Rehabilitation Center on July 26, 2006 for intensive care. 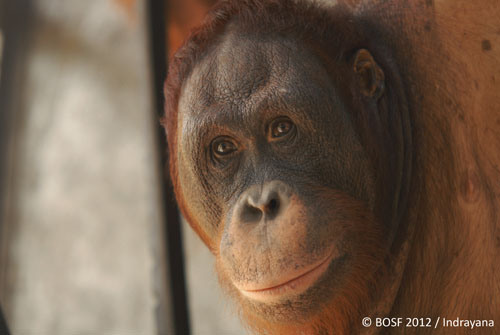 Six years later, 10 year-old Gusti has flourished into a very active and playful orangutan. He has gorgeous thick hair and strong, stout body at 30.6 kg. Gusti also has a distinctive voice. The technicians easily recognize him just by hearing the sound of his calls. Gusti will soon be able to make his distinctive vocalizations known by other orangutans in his new rightful home as he is joining them in the conservation forest of Bukit Batikap! A 4 year-old female orangutan was confiscated by the Central Kalimantan Conservation and Natural Resources Authority from a resident of Palangka Raya who had kept her as a pet for 6 months. Named Iyos, the orangutan was fortunately healthy and showed no sign of fondness or attachment to humans. In other words, she was still wild. However, because of her young age, she could not be directly relocated and released in a forest. Thus she entered Nyaru Menteng Rehabilitation Center on October 16, 2009. Iyos sports strikingly beautiful thick dark hair. She is an agile and quite temperamental orangutan. And now at 7 years old and 23.6 kg, she is finally ready to be released. Iyos is going home! The Central Kalimantan Conservation and Natural Resources Authority confiscated Kopi from a resident of Tumbang Koling Village in East Kotawaringin Regency. The owner had only kept this female baby orangutan for nine days. Dark-haired Kopi was then around 3 – 4 years old and clearly still possessed her wild nature. 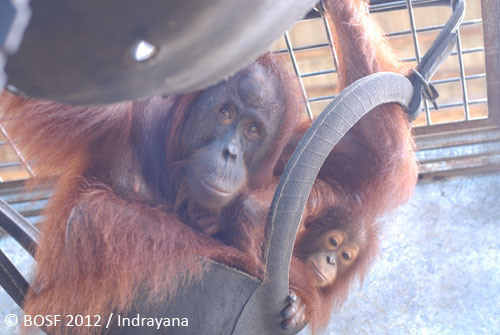 Arriving at Nyaru Menteng Rehabilitation Center on May 1, 2008, Kopi proves to be a handful to manage. 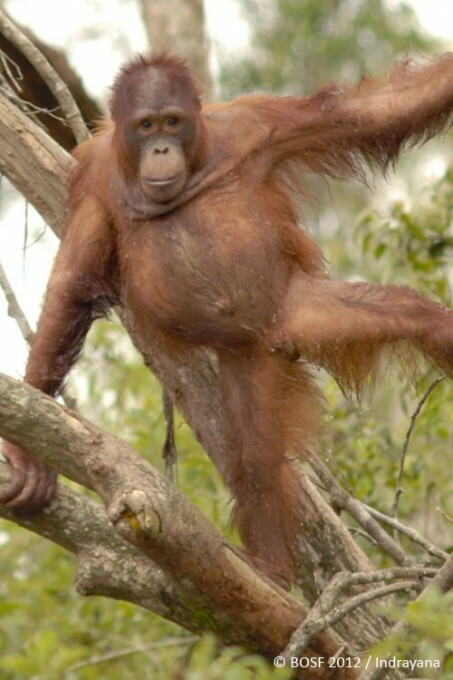 Just like a normal wild orangutan, she is active and does not like to be around humans. In fact, she successfully managed to break free from her enclosure in 2010 and for the next 13 months wandered around in the surrounding forest. We were finally able to re-sedate her again in May 2011, as we were obviously concerned that she would wander into a dangerous situation. She was healthy and obviously had no problem striving in the forest. Therefore, now at 10 years old weighing 27.3 kg, it is only fair that Kopi gets her turn to roam as much as her heart desires in her real home in the forest! Confiscated by the government in the town of Sampit, East Kotawaringin Regency, Giant was approximately 4 – 4.5 years old. The Nyaru Menteng Rehabilitation Center was then informed by the Central Kalimantan Conservation and Natural Resources Authority and we immediately formed a Rescue Team to pick up Giant. 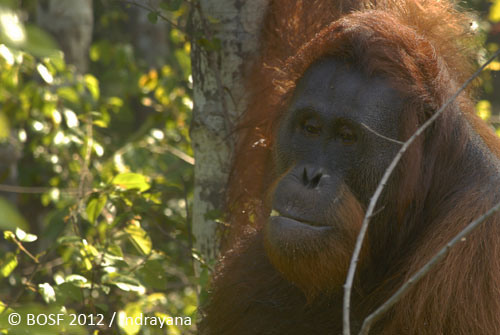 We took this male orangutan to Nyaru Menteng on September 16, 2007. Living in Nyaru Menteng for the past five years, Giant has never lost his wild demeanor. He is unpredictable and is easily irritated by humans as well as other orangutans. Weighing 38.9 kg, his stocky physique naturally intimidates other orangutans and thus Giant often easily takes their food! It is apparent that 10 year-old Giant is more than ready to return to the forest. And so he will. Giant is now preparing to take his final trip home to where he belongs. Reported by the Central Kalimantan District Police in Tangkiling Village in Bukit Batu Regency, a male orangutan was immediately confiscated from a villager who had kept him for a while. He was then taken to Nyaru Menteng on March 15, 2001 at the age of approximately 3.5 – 4 years old and named Menteng.After he passed Forest School at the age of 7, Menteng soon earned his place in one of Nyaru Menteng pre-release islands, Kaja Island, where he flourished into a self-confident and slightly aggressive male; despite his young age, he even stands up to other older males on the island. Weighing 57.3 kg, the 15 year-old is quite dashing with his oval face and bright-colored hair. However, he seldom gathers with female orangutans. Menteng has a special ability, too. He can dive and swim in the shallow part of the river and spends long periods of time sitting in the river to cool off during the hottest part of the day. On April 18, 2001, a group of students in Ketapang, West Kalimantan boarded a floatplane with several ex-captive orangutans, in search of treatment for them at Nyaru Menteng Orangutan Reintroduction Center. One of these orangutans was a 5.5 – 6 year-old male, named Jamiat. Initially, there was doubt regarding his sub-species, considering Jamiat was found in West Kalimantan. However, genetic test results confirmed that he is indeed a Pongo pygmaeus wurmbii, or a Bornean orangutan from Central Kalimantan.Jamiat soon joined Forest School and after graduating, he advanced to Kaja Island, a pre-release island in Nyaru Menteng. Jamiat is now a young adult of 17 years old, weighing 45.2 kg. He has a long black face and dark long hair, giving him a debonair look. He is one of the lowest ranking males on the island and this is also reflected in his size and slow development of his cheek-pads. Living on Kaja Island has allowed him to further develop his natural instincts and wild behavior and he constantly displays his ability to find a variety of food sources. He has a healthy fear of humans and often produces kiss-squeak sounds (produced by pursing lips) when approached, indicating that he is not happy to see his territory invaded. 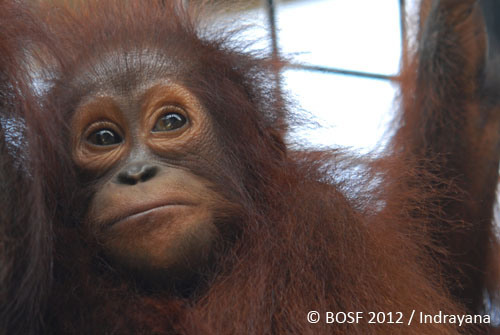 After 11 years of rehabilitation at Nyaru Menteng, Jamiat is finally going home to the forest! There have been a lot of babies who were born in Kaja Island. One of them is Terusan. 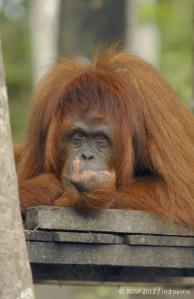 This male orangutan was born on August 19, 2004. The name “Terusan” was given because he was spotted for the first time near the Terusan River with his mother, Dagoy. Terusan still sees his mother everyday but he also loves to play with his siblings and friends. After more than 8 years of living his life on Kaja Island as a free orangutan and learning all he needs to be able to survive in a forest, this active orangutan with long thick red dark hair and round face, weighing 29.2 kg, should thrive in the wild. 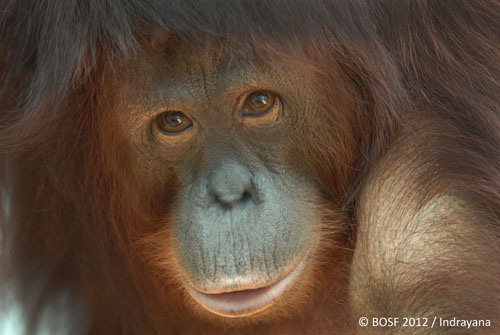 At the beginning of the century, the BOS Foundation received information from a Palangka Raya resident about an orangutan who needed our help. Together with the Conservation and Natural Resources Authority of Central Kalimantan, our Rescue Team was dispatched to confiscate the orangutan from the local community in Henda Village, Pulang Pisau Regency on January 5, 2000. This young female orangutan was around 4 – 4.5 years old and we named her Emen. Like many of our rescued orangutans, Emen suffered physical effects of her time in captivity and as a result she arrived with us having only one thumb remaining on her right hand. After 3 years in Forest School and under the love and care of the team at the Nyaru Menteng Orangutan Reintroduction Center, Emen was moved to our pre-release island (Kaja Island) in 2003 and has experienced life “in the wild” for almost 10 years. Emen has now grown into a beautiful female with long dark brown hair. She is quiet and solitary and never shows aggressive or dominant behavior among her friends on the island. However, she does sometimes spend time with her friends Sif, Leonora and Menteng. In 2009 Emen gave birth to a baby, Embong, and now at the age of 17 years old, weighing 34.3 kg, Emen and her son Embong are finally returning home! 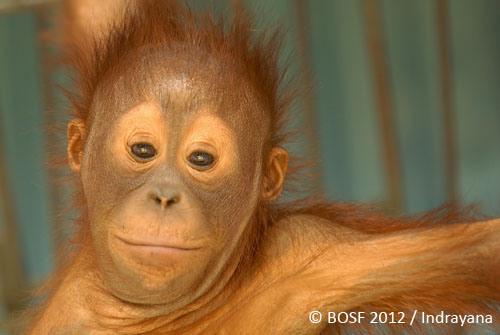 Embong is Emen’s son who was born in Kaja Island on November 30, 2009. This young male orangutan is very active and loves to play with other orangutans. He also loves to explore Kaja Island even though he is only 3 years old. His hair is long, thin with a beautiful red-brownish color. His forehead is wide, which makes him look adorable. Embong has spent 3 joyous years on the island at Nyaru Menteng, learning first-hand about how to survive in the forest from his mother. Weighing 6.1 kg and very healthy, Embong just has to wait a few more days to return to his rightful home in a rainforest, living and learning more in a real forest with his mother, Emen to guide him. Confiscated by the Conservation and Natural Resources Authority of Central Kalimantan from a location in Pulang Pisau Regency, Sif arrived at Nyaru Menteng Orangutan Reintroduction Center on April 27, 2000 together with cage-mate who we named Thor. The young female orangutan was estimated to be between 5 to 5.5 years old. Sif and Thor has been in captivity for almost their entire lives and both suffered from malnutrition. 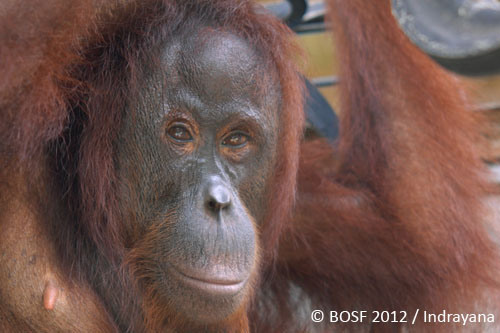 Sif thrived at Forest School and graduated with flying colors. 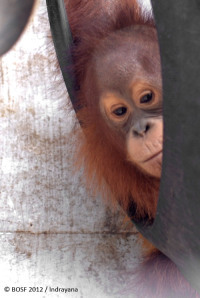 She was then placed on Nyaru Menteng’s largest pre-released island, Kaja Island. She is a very clever female orangutan with a knack for finding delicious forest foods, especially rattan shoots, leaves and insects, but also finds new innovative ways to retrieve foods which have fallen into the river. 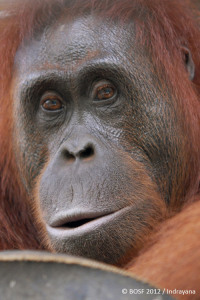 Today, Sif is another fine-looking orangutan with an oval-shaped face, dimple strands, a yellowish curl of hair on her head, slightly black lips and stunning dark red hair. At 18 years old and 35.3 kg, Sif is quiet but can also stand up for herself when needed. She socializes easily with other orangutans and no doubt her intelligence will be put to good use in the wild. This lovely baby orangutan, Sifa who is 2 years old, is Sif’s daughter. She was born on Kaja Island on November 8, 2010. She is indeed a beautiful little orangutan with long bright brown hair, oval face and excotic dark skin. 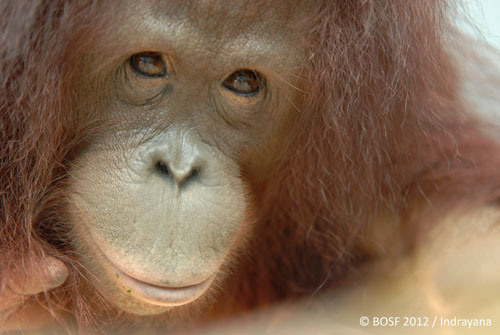 Sifa is still under her mother’s care, but sometimes she also plays together with her friends, Garu and Terusan. Despite her young age, Sifa weighs a very healthy 11.1 kg and has been declared fit, well and ready to be released with her mother. Good luck, Sifa! Living in a real forest will be awesome! Chanel was a young female orangutan, aged 3 – 3.5 years old, when she was confiscated from a community near an oil palm plantation in Parenggen, Kotawaringin Timur Regency on March 3, 2003. 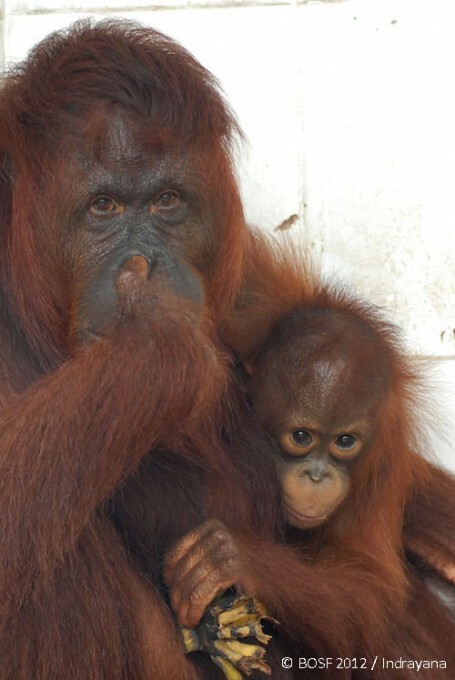 She was brought to Nyaru Menteng Orangutan Reintroduction Center where she has lived for the past nine years. On her arrival she was still very wild and therefore could not join forest school. Instead and at the age of 5 she was introduced to Bangamat Island, which borders Kaja Island. 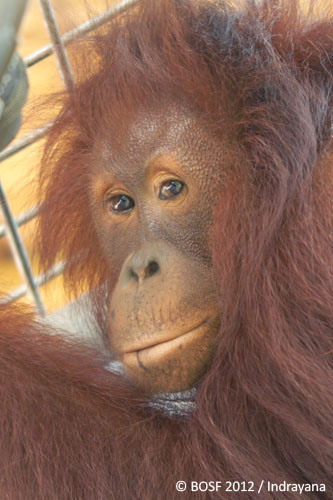 Chanel is a slim, oval-faced orangutan with dark red hair that adds to her charm. She is now 13 years old and weighs 33.9 kg. She is very independent and prefers to be alone. Reclaiming her true nature as an orangutan, Chanel no longer feels comfortable around humans. She makes kiss-squeak sounds – a sound produced by pursing lips – whenever humans are near, indicating that she feels disturbed. Chanel has a 4 year-old boy, named Charlie. And both Chanel and Charlie will join Nyaru Menteng’s 4th Orangutan Release Activity and will finally return home! Charlie is Channel’s son. He was born on May 1, 2009 on Kaja Island. Round-faced with yellowish skin and bright red hair, this endearing young lad loves to play with other orangutans, even with adult male orangutans. At age 4, he is a brave orangutan and is not afraid to wander away from his mother. He is also quite smart. He now has started to learn to make nests. And he will get a lot more fun nest-building practice when he soon returns home to the forest with his mother! When she first arrived at Nyaru Menteng Orangutan Reintroduction Center on April 29, 2000, Gadis was approximately 2.5 – 3 years old. She had just been confiscated by the Central Kalimantan Conservation and Natural Resources Authority in Palangka Raya and was a healthy and active young female orangutan. She had been held captive by a local businessman for approximately 2 years. 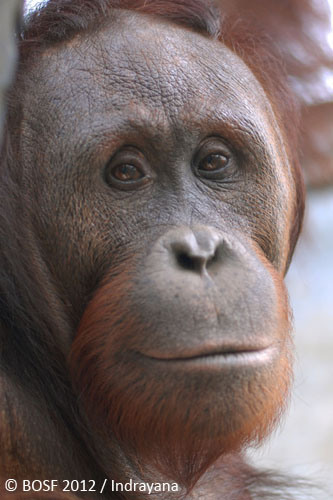 Despite having a slightly asymmetrical face and one lazy eye, Gadis – now 15 years old and 36.1 kg – is still a very attractive orangutan. She has curved cheeks and temples, and also striking dark red hair. The Forest School graduate is very solitary and independent. She loves exploring Kaja Island where she now lives, foraging for various forest foods, and rarely comes to the feeding platforms. Although not particularly sociable with other orangutans, a few years ago, Gadis met Omega, a gorgeous male with huge cheek-pads. The two quickly bonded and courted for a while. Omega sadly passed away, but from him Gadis was blessed with a baby girl, named Garu. 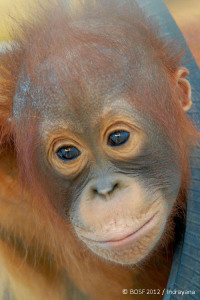 Garu is Gadis’ daughter who was born on Kaja Island on December 15, 2009. 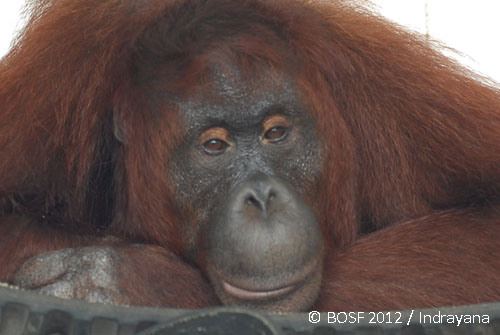 Don’t be fooled by her melancholy face because Garu is actually very active and loves to play! The 3 year-old youngster of course still depends very much on her mother and follows her everywhere. 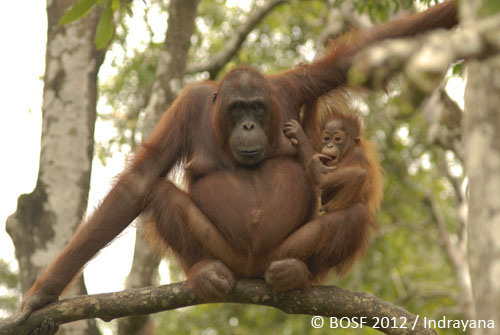 But being born and raised on the island means Garu has developed all the wild behaviors an orangutan should possess. She is feisty and smart. She even has started to learn how to make her own nest. 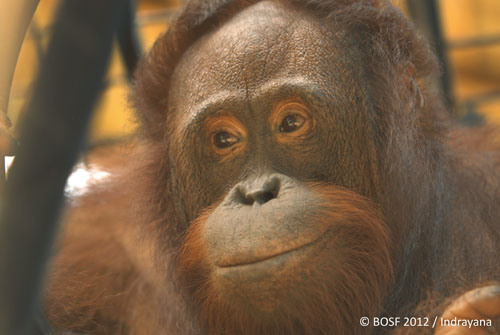 Just like a normal wild orangutan, Garu instinctively avoids humans. Whenever she sees a human, she makes kiss-squeak sounds produced by pursing her lips. Weiging 5.5 kg, this adorable youngster with black spots on her mouth and long thick hair will soon return to a real forest with her mother, Gadis – their real home, at last! This dark-haired female orangutan was confiscated by the Nyaru Menteng Orangutan Reintroduction Center on August 8, 2000 in cooperation with the Conservation and Natural Resources Authority of Central Kalimantan in Palangka Raya. Leonora was then 3 – 3.5 years old and although had been well cared for by a nice family, she had grown too big and was subsequently kept in a small cage outside of their house. In the early days since arriving in Nyaru Menteng, Leonora liked to clap her hands when she wanted food or drink. But after she graduated from Forest School and advanced to the pre-release stage on Kaja Island, that habit slowly disappeared. Sixteen year-old Leonora has now grown into a beautiful individual, weighing 41.3 kg. Her face is rather distinctive with a large mouth area and thin hair on her head. 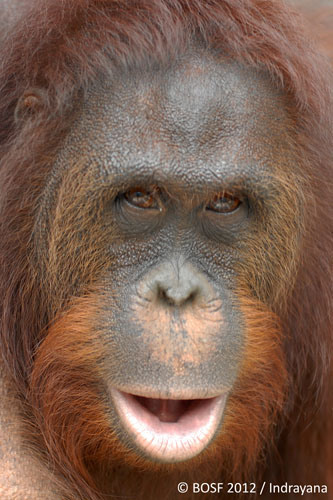 Although she is generally a friendly orangutan, she can be dominant among other females. Leonora has a baby boy, named Lamar, who will very soon be released with her in their real home in the forest! Born in Kaja Island on November 7, 2009, Leonora’s son, Lamar is an active and playful orangutan. With dark red hair, Lamar is sweet and loveable with his mother. He is now 3 years old, weighs 6.9 kg and still prefers to stay in the safe and warm protection of his mother’s loving arms. However, Lamar loves to play and explore the island, as long as his mother is near. At the sight of humans he will kiss-squeak and throw branches and clearly displays second-generation wild orangutan behavior. Very soon, Lamar will have a bigger, greener playground to explore when he joins his mother on their final homecoming trip to the forest in Batikap.